UCC is ranked in the top 50 universities for teaching and learning according to the Times Higher Education Europe Teaching Rankings. UCC is ranked in the top 50 universities for teaching and learning according to the Times Higher Education* Europe Teaching Rankings. 250 universities in eight European countries were ranked for their student teaching and learning environments and their student outcomes. Engagement-does the institution effectively engage with its students? Resources– does the institution have the capacity to effectively deliver teaching? Professor John Cryan, Head of the Department of Anatomy & Neuroscience will become the first UCC scientist to be awarded the Tom Connor Distinguished Investigator Award from Neuroscience Ireland. Professor John Cryan, Head of the Department of Anatomy & Neuroscience and Principal Investigator in the APC Microbiome Institute, will become the first UCC scientist to be awarded the Tom Connor Distinguished Investigator Award from Neuroscience Ireland later today (August 28). University College Cork (UCC) scored top marks across 5 core areas ranked in the EU-sponsored U-Multirank published today. UCC received 13 ‘1’s and 13 ‘2’s. University College Cork (UCC) scored top marks across five core areas ranked in the EU-sponsored U-Multirank published today (Thursday, March 30, 2017). University College Cork has released a video focused on the many connections between its campus and Hogwarts from J.K. Rowling's Harry Potter series. 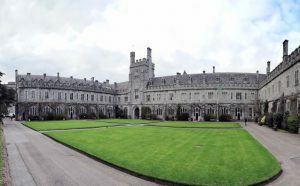 University College Cork has released a video focused on the many connections between its campus and Hogwarts from J.K. Rowling’s Harry Potter series, clocking up thousands of views online. University College Cork has been ranked fourth in the world in a list of the world’s most sustainable universities, achieving the highest result in Ireland. Universitas Indonesia (UI) released its UI GreenMetric Rankings of World Universities 2015, having measured the commitment made by over 400 universities across the globe in developing an ‘environmentally-friendly’ infrastructure. Cork is a city full of charm, energy and culture and has UCC at its heart. Cork is a hub for vibrant IT companies such as Apple, Dell, & IBM. What does Cork (Ireland) have to offer? 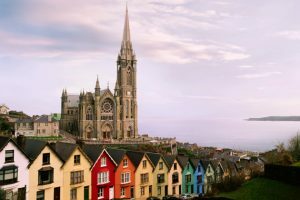 What does Cork in Ireland have to offer? Cork is a city full of charm, energy and culture and has UCC at its heart. According the Corkonians, it is the REAL CAPITAL of Ireland; it has all that larger cities have to offer but is more relaxed, safer and less expensive. Cork is a hub for vibrant IT companies such as Apple, Dell, EMC, and IBM. 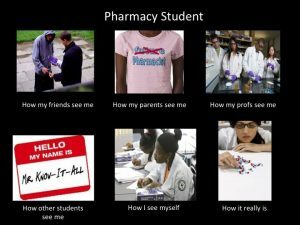 Want to study Pharmacy? 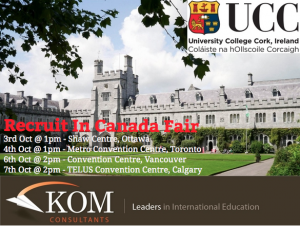 Want to study in Ireland? 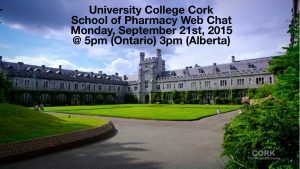 University College Cork – School of Pharmacy are taking part in their first webinar in a couple of weeks. Don’t miss this exciting opportunity to chat to the school of pharmacy about their MPharm program and about studying and life in Ireland. Why Study Pharmacy at UCC? Here’s 10 Great Reasons Why! Ever thought of studying Pharmacy in Ireland? KOM are now taking applications for University College Cork's 5 year MPharm Program. Apply NOW! A pharmacist is a healthcare team member specifically concerned with drugs and medicines. Pharmacy at UCC provides the confidence, skills and knowledge to make a difference in the pharmaceutical arena.